My friend, LueRachelle Brim-Atkins wrote the following to her family shortly after the Nov. 4 election of Barack Obama as President. There was a time when our grandfather, Big Daddy, was the only African American "allowed" (you read it correctly) to vote in Naples, Texas. Mother said she, Uncle P.Y. and our grandmother, Mother Gray, would wait at the edge of the yard for Big Daddy to come home and they'd run and hug him as though he had been on a long journey. They were so afraid that he would be killed for voting. He found out later that the white folks "allowed" him to vote as the principal of the school but they tore up his ballot as soon as he left the voting booth. I can only imagine the humiliation he felt when he learned this years later. I don't even want to think about how that message was delivered to this dignified and educated man. When I went away to college, I walked the streets of Dallas with other students from Bishop College, registering Black people to vote and informing them the poll tax that had prevented them from voting all their lives (when you have to choose between paying poll tax and feeding your family...) had been declared unconstitutional. When Jimmy Carter conceded the 1980 election because the votes from the East Coast had declared his loss, I was on my way to the polls from work here in Seattle. I went to vote anyway, knowing that my grandfather had paid the price of humiliation to give me my right to vote. Today, the one we've been waiting for--the one the ancestors and the country have been waiting for--is President-elect of the United States of America. He--and we--are the ones we've been waiting for. Hallelujah! This page contains a single entry by Lynn Allen published on April 20, 2009 9:47 PM. Democracy is a Participation Sport! was the previous entry in this blog. 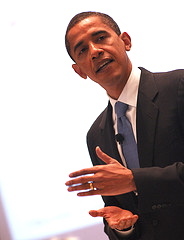 Stimulus in Seattle, from Roosevelt to Obama - KUOW is the next entry in this blog.